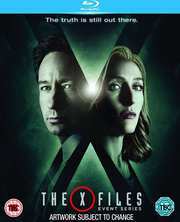 Thirteen years after the original series run, the next mind-bending chapter of THE X-FILES is a thrilling, six-episode event series from creator/executive producer Chris Carter, with stars David Duchovny and Gillian Anderson re-inhabiting their roles as iconic FBI Agents Fox Mulder and Dana Scully. Mitch Pileggi also returns as FBI Assistant Director Walter Skinner Mulder and Scully's boss who walks a fine line between loyalty to these investigators and accountability to his superiors. This marks the momentous return of the Emmy and Golden Globe Award-winning pop culture phenomenon, which remains one of the longest-running sci-fi series in network television history.